Amongst the larger to quite large species of wrasses offered regularly to off and on in the aquarium interest, the Red Coris (Coris gaimard), Bird Wrasse (Gomphosus varius) and the occasional Maori or Splendour Wrasse (genera Cheilinus and Pseudocheilinus) are well rounded out with about the only Razorfish wrasse the industry sees, the similarly rambunctious to the point of pugnacious, Dragon or Rock Mover Wrasse, Novaculichthys taeniourus. It's not too often that common names of aquatic organisms fit their species so well. The Razorfishes are so-called for their prominent wedge-shaped foreheads, useful for dodging into sandy substrates to avoid predators, underwater photographers and aquarists... and to catch a bit of rest undisturbed. The aquarium common name "dragon" fits particularly this species as juveniles... with their prominent dorsal spines, sinuous "dancing" swimming motions and sinister prominent front teeth! Rock Mover alludes to the species prodigious digging, rock-rearranging penchant. In the wild where they are found, it is not surprising (actually it is) to see this fish moving veritable boulders that must equal a few times their body weight, looking for food organisms, or having found same, dashing them against rocks to break shells, external skeletons. Novaculichthys taeniourus (Lacepede 1801), the Rock Mover, Dragon or Indian Wrasse (2) is a very hardy fish that is more often killed by aquarists than dies from other influences. As an aquarium specimen this species requires regular "beefy" feedings of animal-based foods. It is a gluttonous feeder that quickly starves if underfed. Not for reef tanks, Razorfishes are territorial and aggressive fishes. To about a foot in length. Juveniles and adult in Hawai'i shown. There is one other species in this genus, but it's not used in the trade. The Dragon Wrasse has a surprisingly wide distribution, occurring between 30 degrees north and south latitude, all the way from tropical East Africa and the Red Sea to the Gulf of California (Sea of Cortez), on down to the Galapagos, about Lord Howe Island in Australia, north to Japan's Ryukyu islands. 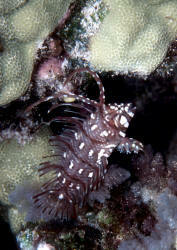 It is most plentiful and collected for the aquarium trade in the Hawaiian Islands. 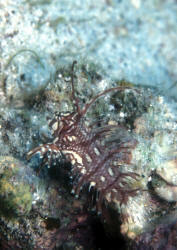 This fish is "oh-so-cute" as a juvenile, being offered almost always at about 2-3 inches in total length, but beware (!) that although still good-looking, the Dragon turns into a good-sized Rock Mover of upwards of a foot in length. When small, Novaculichthys is found invariably over mixed rubble and sand bottoms in areas of mild to moderate surge... as apparent flotsam, being blown back and forth, adding their sinusoidal movements to give the appearance more of terrestrial leaves than fishes. Adults are found in similar but wider type settings of depth and surge, often working in pairs. One specimen pushing/pulling over small rocks, while the other makes dashes at invertebrate food items. Take care when arranging the large rock, live or no... placing larger pieces securely on the tank bottom (not on sand) and others in turn squarely over/on these, as the Rock Mover may well burrow under the rock upsetting it and damaging itself in the process. In captivity this fish needs the same sort of setting to thrive; a two-three inch or greater soft sand substrate, mix of small rubble pieces and some larger rock to hide amongst. This is not only a large aquarium species of great energy, but also a messy-eating and defecating fish that does best in circumstances of high circulation, aeration and biological and physical filtration. 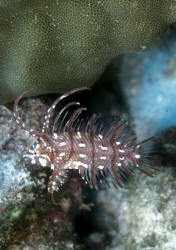 Rockmovers are NOT reef-safe animals with anything other than stinging-celled organisms. They gleefully consume echinoderms like sea urchins, small sea stars, worms of all kinds, crabs and shrimps in the wild, and will do the same in your system with the opportunity afforded. Fishes of like size and temperament (rough and tumble) are all they should be housed with... and not overly crowded amongst. Dragon Wrasse are territorial and can be pure terrors if they consider themselves challenged. As specimens they should be placed last and at slightly smaller size than your other fish stock. If there are marine aquarium fishes easier to feed than the Dragon Wrasse I don't know them. Novaculichthys taeniourus (there is a congener, N. macrolepidotus, unseen in the trade) will greedily accept any and all foods, the meatier the better. As a matter of fact, the real concern with keeping this fish is making sure all the other fishes it's kept with get something to eat. Toward this ends it's a good idea to practice/offer food in two opposing corners to provide a running/swimming chance for your less eager eaters to get their share. Oh, in the event your new Rockmover doesn't feed initially, even to taking to hiding under the substrate for a few to several days, don't be overly concerned... assuredly it will re-emerge, particularly if you can offer it some food near the bottom toward "lights out" time. 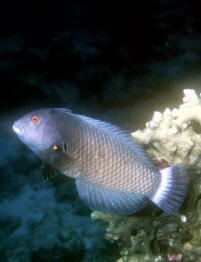 While Dragon Wrasses aren't immune to the usual parasitic scourges of reef fishes, they are generally quite tough, amongst the hardiest fishes to survive capture, holding and shipping from the wild (all are wild-caught), and being amongst the last to succumb to pathogenic or environmental disease. As labrids/wrasses go, the species is not overly sensitive to copper-based remedies, and can be treated with full doses along with environmental manipulation (elevated temperature, lowered specific gravity) in treatment regimens. Though definitely not for everyone (will eat even hermit crabs! ), the Dragon Wrasse, aka Rockmover, is an overtly outgoing species that adapts well to captive settings, provides endless (if it isn't buried!) entertainment and hardy fish species for boisterous fish-only and fish and very tough invertebrate tanks. Burgess, Warren E. 1977. The dragon wrasse. TFH 8/77. Campbell, Douglas. Marines: their care and keeping; wrasses, parts 1,2. FAMA 12/80, 1/81. Friese, U. Erich. 1977. Wrasses. Marine Aquarist 7(8):77. Hoover, John P. 1995. Hawaii's wrasses, parts 1,2. FAMA 5,6/95. Parker, Nancy J. 1975. A demon dressed in scales (dragon wrasse). Marine Aquarist 6(6): 75.